Chinese yam (aka 淮山 or山藥 in Chinese) is commonly used in Chinese cooking, especially for making soup and congee. 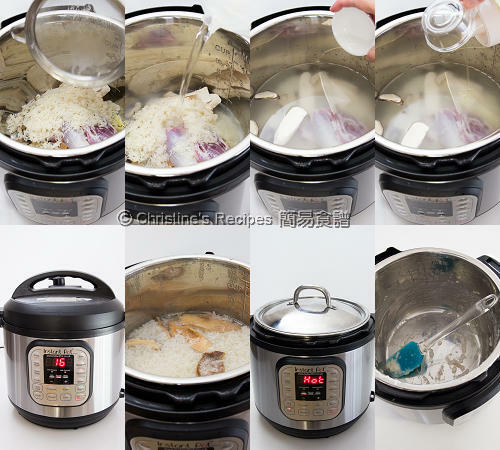 Again I experimented my new kitchen toy, Instant Pot, to make a large pot of pork congee. How was the outcome? I was quite impressed by its pressure cooking power. After running only a cycle of its “porridge” function, about 20 minutes, all the rice turned to be very soft and started to break apart. The texture was like the “Chiu Chau Teochew” (潮州粥) version. It’s good enough indeed. Yet my family used to have the Cantonese version, with all grains totally broken down, giving you a thicker consistency, not as runny as Teochew version. So, I took one more step to achieve that consistency. It’s not that complex as I thought. Simply press the “saute” button and cook for 15 minutes or so. Voila! The congee was just like the one that we used to enjoy. Initially, I had a bit of worry if the rice would stick to the inner pot bottom. 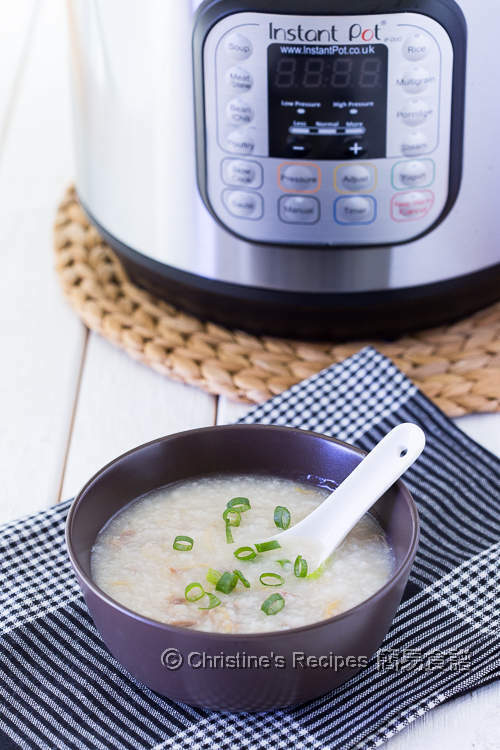 Luckily, it proved that I got the right pressure cooker to make our favourite Chinese congee. Rinse rice and drain well. Soak the shiitake mushrooms until softened. Shred them and set aside. Soak the dried mandarin peel. Use a knife to scrape away the white inner part as it tastes bitter. When the “porridge” programme is finished, allow the cooker to reduce in pressure naturally. All the grains are very soft enough to enjoy. After pressing the “saute” button, don’t close the pressure cover. 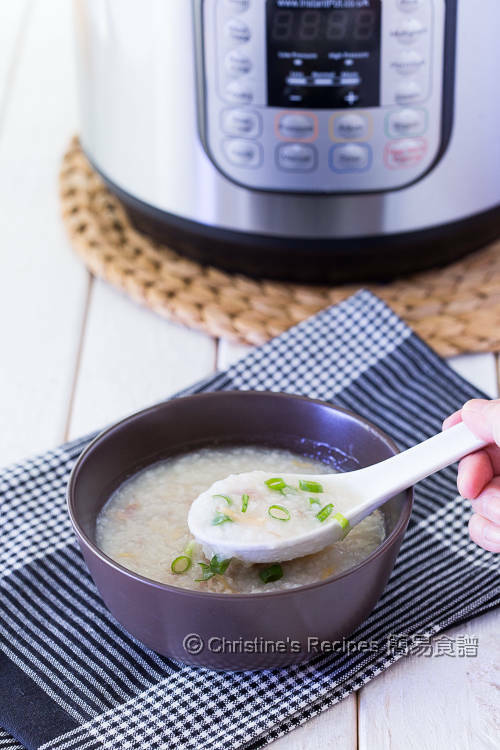 You might cook the congee without any lid, or cover it with a tempered glass lid designed especially by Instant Pot. I used a 22-cm / 9-inch stainless steel lid from Ikea instead. It works perfectly without any condensed water leaking out into the outer pot. If you're interested in getting an Instant Pot, here's the info for you. I got it from Amazon (UK) as the model for sale in UK, with 220 volts, suitable for using in Australia. If you’re living in US or any countries with 110~120 volts electrical system, the model listed on Amazon (US) is the one to go for. Grew up eating congee and whenever I am under the weather, all I want is a bowl of homemade congee. This looks really delicious, Christine. Thanks, Angie. We're so alike, growing up with eating similar foods. Loving these instant pot recipes! Thanks, Sonia. I love instant pot too. Will keep more coming. I am so glad to chance upon this, I have been contemplating to get an instant pot, and I am sold! Please post more instant pot recipes! Btw, can I omit mandarin peel for the congee? How would it affect the taste, or is there any substitute? Thanks Christine. I use instant pot nearly everyday. Will keep more IP recipes coming for sure. You might omit the mandarin peel. It's for increasing fragrance, won't affect the taste of the congee. Does 2 L water translate to 8 cup of water? Isn't that a bit too much water for Congee? I was reading the menu and it say it recommand 1:5 Ratio water for congee. The ratio of water and rice used depends on how thick the congee consistency you like. It's no right or wrong. As my husband doesn't like his congee too thick, and I need to use "saute" function to finish off and produce the HK style congee consistency, thus I have to add more water than suggested in the menu. You might try the one close to your liking. Can you comment on the instant pot. I am thinking of getting one but not sure whether it will just become a piece of furniture after the first few months of use. Do you use it often and is it safe? Is it easy to clean? Do the meals turn out tastier than regular stove cooking? I love my instant pot and use it weekly. Up to now, I haven't had any problems with it. IP is controlled by some built-in electrical programmes, so the cooking time is very accurate. I can get the same results every time. I don't think the meals made with IP are tastier than those made on stove. But I can say if you use it properly, IP can also produce tasty dishes compared to those cooked on stove and shorten lots of cooking time. Great recipe. Just wondering where you recommend buying dried scallops online? It is not available in stores where I live. Thanks in advance! I often buy dried scallops when I travel back to Hong Kong. Sorry, no idea where to get it from online. Might be a good idea to try Amazon.